Naples is the capital of the Italian region Campania and the third-largest municipality in Italy after Rome and Milan. On the 28th (Thu), make a trip to Gli Scavi Archeologici di Pompei. To find ratings, maps, other places to visit, and tourist information, refer to the Naples trip planner . Munich, Germany to Naples is an approximately 5-hour flight. You can also do a combination of flight and train; or drive. Traveling from Munich in June, expect Naples to be somewhat warmer, temps between 32°C and 22°C. Wrap up your sightseeing on the 29th (Fri) to allow time to take a train to Rome. Rome is known for historic sites, museums, nightlife, shopping, and classes. Your plan includes some of its best attractions: contemplate the long history of St. Peter's Basilica, explore the world behind art at Vatican Museums, explore the ancient world of Colosseum, and make a trip to Roman Forum. To find reviews, photos, other places to visit, and other tourist information, use the Rome online tour planner . Getting from Naples to Rome by train takes about 1.5 hours. Other options: drive; or take a bus. In June, daily temperatures in Rome can reach 34°C, while at night they dip to 21°C. Wrap up your sightseeing on the 2nd (Mon) early enough to take a train to Florence. Florence is known for museums, historic sites, shopping, classes, and nightlife. Your plan includes some of its best attractions: explore the world behind art at Uffizi Galleries, admire the natural beauty at The Boboli Gardens, take some stellar pictures from Piazzale Michelangelo, and take in the views from Ponte Vecchio. For reviews, more things to do, maps, and other tourist information, refer to the Florence sightseeing tool . You can take a train from Rome to Florence in 1.5 hours. Other options are to drive; or fly. Traveling from Rome in July, plan for a bit cooler nights in Florence, with lows around 21°C. Wrap up your sightseeing on the 5th (Thu) early enough to take a train to Milan. Start off your visit on the 5th (Thu): admire the landmark architecture of Galleria Vittorio Emanuele II, then contemplate in the serene atmosphere at Duomo di Milano, and then stroll the grounds of Monumental Cemetery. For where to stay, reviews, ratings, and tourist information, use the Milan trip planner . You can take a train from Florence to Milan in 2 hours. Alternatively, you can drive; or take a bus. In July, daytime highs in Milan are 34°C, while nighttime lows are 21°C. 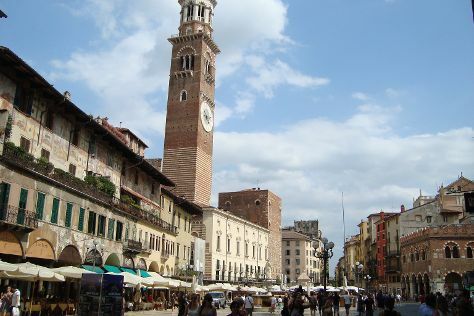 Wrap up your sightseeing on the 6th (Fri) to allow time to take a train to Verona. Kick off your visit on the 6th (Fri): wander the streets of Quinzano, admire the masterpieces at Museo di Castelvecchio, then don't miss a visit to Piazza delle Erbe, then admire the striking features of Casa di Giulietta, and finally see the grandeur of opera at Arena di Verona. To find where to stay, maps, traveler tips, and other tourist information, refer to the Verona road trip tool . Traveling by train from Milan to Verona takes 1.5 hours. Alternatively, you can drive; or take a bus. Expect a daytime high around 36°C in July, and nighttime lows around 22°C. Finish up your sightseeing early on the 7th (Sat) so you can catch the train to Venice. Start off your visit on the 7th (Sat): browse the exhibits of Doge's Palace, snap pictures at Ponte dei Sospiri, then take in the architecture and atmosphere at Basilica di San Marco, then take a stroll through Campo del Ghetto, and finally contemplate the waterfront views at Canal Grande. Here are some ideas for day two: snap pictures at Ponte di Rialto, then pause for some serene contemplation at Basilica di Santa Maria della Salute, then explore the world behind art at Peggy Guggenheim Collection, and finally get to know the fascinating history of St. Mark's Square. Start your trip to Venice by creating a personalized itinerary on Inspirock. Traveling by train from Verona to Venice takes 1.5 hours. Alternatively, you can drive; or take a bus. July in Venice sees daily highs of 36°C and lows of 22°C at night. Wrap up your sightseeing on the 8th (Sun) early enough to travel back home.